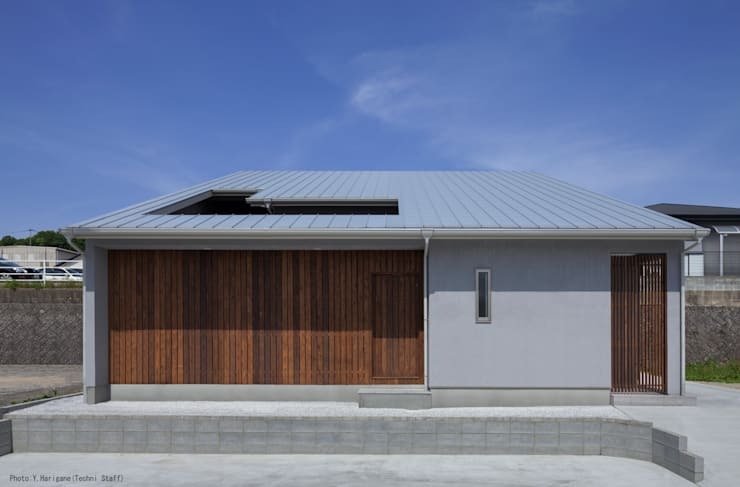 This elegant grey home is a fine example of contemporary Japanese architecture. 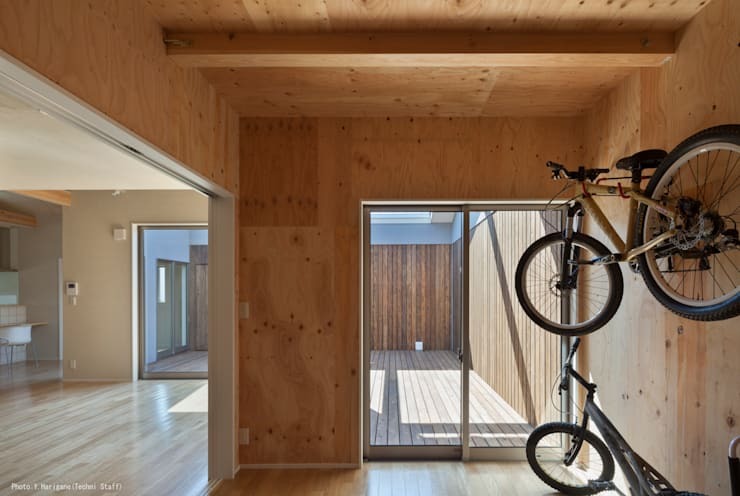 The two storey wooden building was designed by Matsuoka Kenji Architects and is located in a quiet residential section of Kama City in the Fukuoka Prefecture of Japan. The minimalistic façade of wooden slats and grey metal is so humble, that it would be easy to miss the unusual L-shape cut out of the roof. But if you do, you might guess that this is a home with a surprising courtyard space inside. 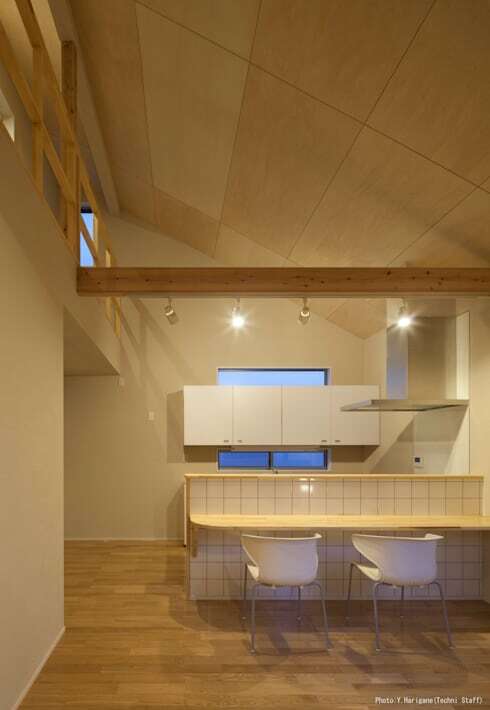 As with many Japanese homes, wooden finishes permeate throughout and the colour schemes are subtle and understated. But there's nothing conservative about the configuration of the layout. This is above all a contemporary home with a unique character all of its own. For beautiful photos and more details, come with us on a tour of this very special home. 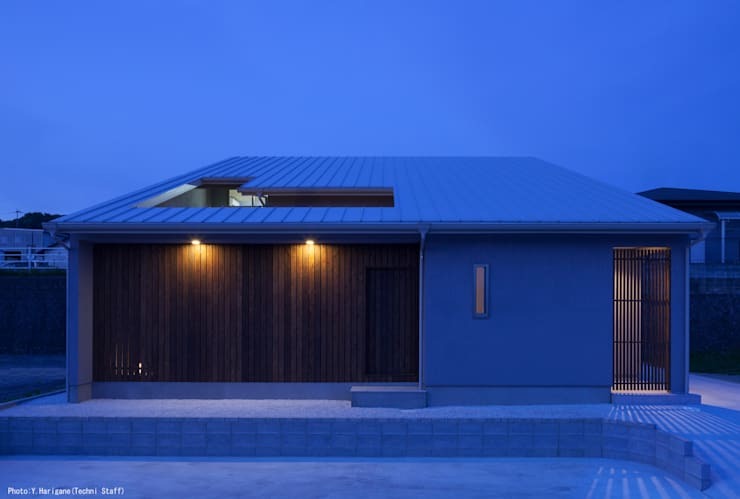 The facade presents as a simple box construction with a sloping blue-grey roof, matching grey metal wall and a larger expanse of warm wooden panels. As with many contemporary Japanese homes, the facade is minimalistic and offers a simple serene ambience. There is just one small, narrow front window. Clearly this is a home in which the occupants have asked for privacy. But this is no home cut off from the elements of the outside world. From here, we can clearly see the L-shaped cutout of the roof that leaves it partly open to the elements. While the grey roof and steel wall dominate the façade during daylight hours, the timber panelling dominates at night. It's a striking difference and a beautiful one. The lighting choices are no mere afterthought. 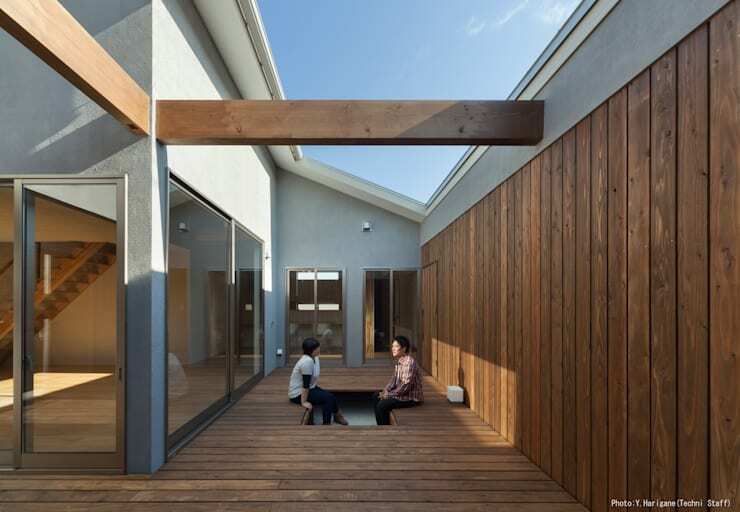 Light and shadow play is an important consideration in Japanese architecture. From inside the home we can see the courtyard area formed by the L-shaped cut-out in the roof. Dark timber panelling covers the walls and floors to create a warm, but simple style. It's an unusual courtyard that allows the occupants boundless sky views and fresh air, without sacrificing any of their privacy. A series of glass sliding doors on the left allow all that generous light and fresh air to circulate through the house. But it's the unusual seating that has our attention. A novel indentation or sunken floor has been added to create a seating arrangement that seems so natural we can't believe we haven't seen it before. The height of the angled roof allows for a mezzanine level on the rear half of the house. 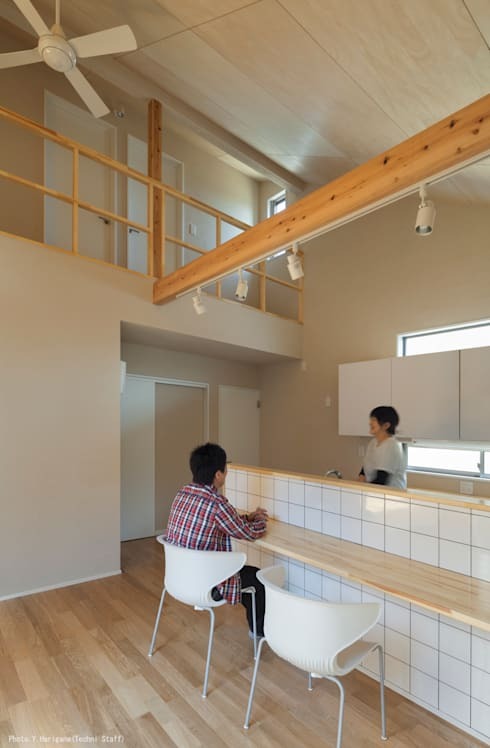 From the kitchen here, we can see how the simple construction of a wooden support beam and bannisters allow for visual unity and open communication between the two levels. As with all the rooms in the home, the colour scheme here is composed of mute creams and the natural golden hues of the timber finishes. From this angle we can see the sharp incline in the roof that was not immediately apparent from the front facade. While some designers may have been inclined towards building lofty cupboards or accentuating the height of the room in other ways, this architect has chosen to actually counterbalance the height with the use of horizontal lines. The humble series of small white kitchen cupboards intersect the shape of a rear window. A simple kitchen bench follows the same line while an overhead support beam accentuates the quiet effect. We will backtrack now towards the entrance area. After exploring the refined aspects of this design, it might be surprising to discover that simple plywood has been used for the walls of the entrance area. It's a clever choice of course because this area doubles as an innovative bike rack and will surely have its share of knocks and tumbles. But as with the kitchen that is both big and small, this choice of materials was a humble one. The roughness and knotted irregularity of plywood reflects the aesthetic principal of wabi-sabi. This is a concept that we see time and time again in Japanese architecture. It's based on an acceptance that imperfection and authenticity are part of existence and this should be acknowledged. There's something slightly intangible about the way this has been integrated into the design, but we feel that perhaps it's the reason this home has a special, almost serene ambience all of its own.